On Thursday, George W. Bush and former U.S. president Bill Clinton (himself an accomplished war criminal) will be attending the Surrey Regional Economic Summit at the Sheraton Vancouver Guildford Hotel. Here’s some information from the Canadian Peace Alliance on what you can do to support Bush’s arrest for war crimes. » Report George W. Bush as a person likely to try to enter Canada contrary to section 35 of the Immigration and Refugee Protection Act. George Walker Bush, born July 6, 1945 is likely to try to cross the border into Canada on or about October 18 to 20th 2011 to attend an event in Surrey British Columbia. 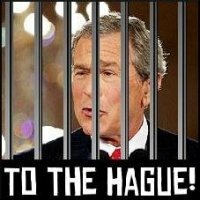 Mr. Bush has admitted to authorizing and approving the widespread use of torture by the U.S. Armed Forces and the CIA. There are reasonable grounds to believe that George W. Bush, as the President of the United States of America and Commander in Chief of the U.S. Armed Forces between 2001 and 2009, counselled, aided and abetted the commission of torture and other war crimes and crimes against humanity in Iraq, Afghanistan and other locations. Experts estimate that in Iraq alone, over a million innocent men, women and children have died as a consequence of the illegal U.S.-led war on Iraq authorized and directed by George W. Bush. N.B. the website indicates that CBSA has discretion to provide a reward for information. Join at the parking lot outside the Bay, Guildford Mall, SW corner of 152 St. & 104 Ave.